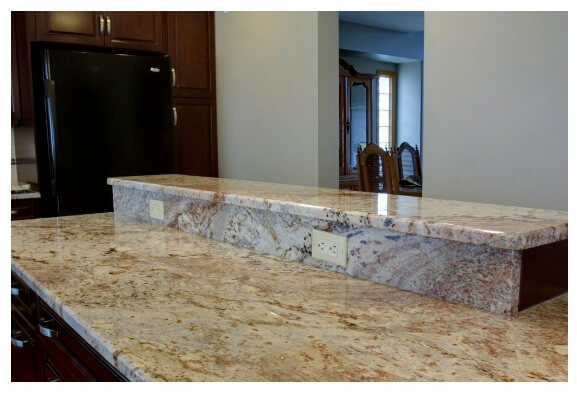 Maintaining a marble countertop not only gives it a good finish, but also makes it look new all the time. If you have a kitchen marble slab, then you should clean it using the following steps. Start by taking a wet sponge and cleaning the surface with warm water. Wipe away any residue or spillage using the wet sponge. If you still find any streak marks or dull surface, then it might be due to the soap deposit. Rinse the surface of the marble using hot water and remove the excess water in the end using sponge. Wipe the surface using a soft towel or cloth. Don’t allow it to air dry. Ensure that you are cleaning the marble with the above steps on regular basis. Use light circular motions to clean the marble surface. You can also use the dishwashing liquid of the kitchen to clean the marble. One of the main marble countertops benefits are its hard surface. Any sponge can be used to apply the marble polish on the top to give it a shine. If the marble countertop has any stain, then use the following steps to remove it. For the general stains, poultice is the most effective stain remover. Start by taking the required amount of poultice and form a paste. Make sure to read the manufacturer’s instruction at the back of the box before proceeding. Apply the paste on the stained area and keep it there. Ensure that it overlaps the stain completely. Cover the paste using a plastic wrap and tape the sides of it. Allow the paste to set. This can take from few hours to one day. After the paste is dry, wipe it off using a wet sponge. Wash the area completely using hot water. Wipe the excess water using a soft cloth and make the surface dry. If the stain still persists, repeat the process. If your countertop is used excessively then it is advisable that you apply a stone sealer to it. While cooking and eating, use coaster under all the glasses and the dishes to avoid any stain marks on the stone. Use tray while cutting and pouring anything on top of the countertop. Though marble is hard stone, but having little bit of extra safety is not bad. Avoid spilling wine or alcoholic products on the surface of the marble. Avoid the spillage of any citrus drinks too. Don’t put very hot items directly on the marble surface. Use trivet or thick cloth beneath. Apply clear wax layer on the top of the marble to protect the surface from stains. Avoid waxing the surface as it may turn stone yellowish over a period of time. For daily maintenance of the marble, using a wet cloth to clean the surface is sufficient. You don’t have to use any special liquid to clean it on daily basis.